Thousands of travellers have had their Christmas plans disrupted by further snowfalls across Western Europe. Hundreds of flights have been cancelled at Charles de Gaulle airport near Paris where 2,000 passengers were moved from a terminal because of snow on the roof. Brussels airport was also badly hit and Belgians were warned not to drive. Hundreds of road accidents have been reported across Germany, and in northern Italy heavy rain has caused flooding in parts of Venice. Unusually high water levels were reported in the Venice lagoon. In the town of Vicenza, west of Venice, people were moved from their homes because of high river levels. Airport authorities at Charles de Gaulle ordered part of Terminal 2E to be cleared of passengers because of fears that the roof might collapse under the weight of 60cm (2ft) of snow. In 2004, the same roof collapsed shortly after the terminal opened, killing four people. The disruption at Charles de Gaulle was also blamed on a shortage of de-icing fluid, and the cancellation of flights led to 2,000 people being stranded at the airport overnight. The French authorities, struggling to cope with the country's third major snowfall of the winter, said fresh supplies were on their way but would not arrive before Monday. Air France's head of operations Michel Emeyriat said he was extremely sorry for the delays, adding: "I haven't seen this [situation] in the past 10 years." Later, AFP news agency quoted the French civil aviation authority as saying that conditions at the airport would return to "normal" by Saturday. The Danish authorities on the Baltic island of Bornholm say they have given up trying to clear roads blocked by snowdrifts. Three people have been reported missing and police have reiterated pleas to people to stay indoors because of the treacherous conditions. Hundreds of tourists spent the night on ferries, in army barracks and a sports hall. It is thought many of them may be unable to return to the mainland before Christmas. Heavy snow also caused major disruption to roads and rail services in Sweden. Dublin airport in the Irish Republic was forced to suspend flights several times. 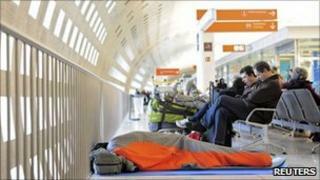 Some passengers were forced to spend the night at Brussels airport. Georgian student George Gegechkori, 22, said he had two flights cancelled and that his flight out on Christmas morning was not guaranteed. "My flight to Atlanta, USA, on the 21 December was cancelled because of ice," he told the BBC. "Today I got all the way through passport control and security and was sitting by the gate only to have my flight cancelled 10 minutes before departure. "Professionally speaking, the airport should be prepared for this. It's not the Second Coming." In western Germany, traffic was paralysed in parts of North Rhine Westphalia. Further east, the railway line between Berlin and Hanover was blocked because of frozen overhead power-lines. In Britain, heavy snow has been forecast for parts of Scotland and north-eastern England, and passengers are facing reduced services on several railway lines. Dutch police said the wintry weather had helped them identify and arrest cannabis-growers because their attic lights had melted snow from the rooftops.